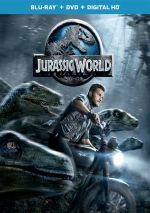 25 years after Jurassic Park became an era-defining smash and three years after Jurassic World reestablished the franchise as a commercial juggernaut, 2018’s Jurassic World: Fallen Kingdom continues the fun. After the devastation depicted in the 2015 film, the dinos of Jurassic World remain left on the island to fend for themselves. This would seem to be a decent way to let them exist, but a volcano will soon lay waste to their territory. 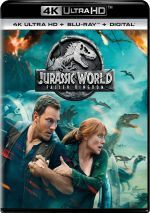 Former JW employees Owen Grady (Chris Pratt) and Claire Dearing (Bryce Dallas Howard) join a team to rescue the creatures, a task soon complicated by nefarious plans hatched by unscrupulous parties. To at least a minor degree, the 2015 World remade the first Park, and I find a similar comparison between Kingdom and 1997’s Lost World. In both films, characters attempt to extricate dinos, and we get do-gooders and baddies involved in these efforts. No, the two aren’t clones, but clear similarities exist. When I first saw the 2015 World, I didn’t much like it, but a second screening revealed its charms to me. When I first saw Kingdom, I didn’t much like it, but after my experience three years ago, hope sprung eternal that a follow-up viewing would alter my opinion. Nope. If anything, I liked Kingdom less the second go-round, as its flaws became even more evident. Take Benjamin Lockwood (James Cromwell), a totally new character we’re led to view as Woz to John Hammond’s Jobs. Seriously – five films into the franchise and Kingdom pulls out a never-mentioned guy who was a major cog in the whole operation? There’s no question in my mind that Lockwood wouldn’t exist if Richard Attenborough hadn’t passed a few years ago. While the choice not to recast Hammond shows respect to Attenborough, I’d actually have preferred that path, as it would make roughly 1000 times more sense within the franchise’s universe. Or better yet: leave out the character entirely! In terms of this film’s story, I can’t find much reason for the plot elements related to Lockwood or his granddaughter Maisie (Isabella Sermon) to exist. Sure, the movie ties them in to the overall narrative, but the script easily could’ve omitted them and likely been better for their absence. As discussed in this disc’s supplements, the film’s producers view Kingdom not as a sequel but as the second chapter in a trilogy. I’m betting that none of them anticipated a grand three-film arc in 2015, as World radically outperformed expectations, but now they’ve gone full George Lucas and decided to cram everything into some form of elongated narrative. Despite some questionable decisions, Lucas made that work in the Original Trilogy, but Kingdom doesn’t. Again: Lockwood! The Star Wars equivalent would be if Lucas told episodes four through seven with Obi-wan still a figure and then dropped Yoda out of nowhere in episode eight. Okay, that’s not the greatest analogy, but much of Kingdom reeks of Star Wars Prequel Trilogy “retconning”, and too much of it seems to exist solely to set up the next film. Take Maisie. While I feel that the movie would work without her – and probably be better – the ending to Kingdom makes it clear that she’ll play a significant role in the next movie. Might this justify her presence/usage here? Perhaps – I doubt it, but it’s possible. She remains a weak link in Kingdom, though, and just not a role that serves any grand purpose I can perceive. World was the first Jurassic not to feature any of the 1993 film’s main participants – sorry, but BD Wong doesn’t count. Kingdom brings back Jeff Goldblum and promptly wastes him. Rather than involve Ian Malcolm in the story, Kingdom instead turns him into a whiny nag whose nattering bookends the movie. Like Maisie, Malcolm’s usage here may feel more logical after I see the next movie, but I won’t bet the farm on that. As it stands, it feels nearly insulting to give fans their beloved Dr. Malcolm and barely use him. At times, Kingdom manages some good dino action, and director JA Bayona pulls off a sense of ominous creepiness well – perhaps not a surprise since he comes from a horror background. Despite my complaints, Kingdom never threatens to become an actual bad movie. But it also can’t turn into anything very good. Kingdom keeps me interested enough that I still look forward to the next film, but it remains a disappointment saddled with too many self-inflicted wounds. 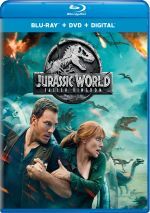 Jurassic World: Fallen Kingdom appears in an aspect ratio of approximately 2.39:1 on this Blu-ray Disc. As expected, this became a fine presentation. At all times, sharpness appeared positive. As such, I thought the image seemed accurate and well-defined. I noticed no signs of shimmering or jaggies, and the movie lacked any print flaws. Teal? Check. Orange? Check. Color-related creativity? Nope. The hues followed predictable stylistic paths, but the Blu-ray executed them in a positive manner. Jurassic movies have always been sonic delights, and the DTS X track of Kingdom followed that tradition. Downconverted to DTS-HD 7.1, the mix used all the channels in a lively, involving manner. Dinos, vehicles, weapon-fire, and other action elements popped up from all around the room and delivered a smooth, engrossing soundscape. Effects became the most prominent component, of course, and packed a solid punch, with positive clarity and range. People invest major bucks in home theaters for audio like this, and Kingdom delivered the goods. The Blu-ray presents a whopping 16 featurettes, and these begin with the three-minute, five-second On Set with Chris & Bryce. It includes comments from executive producer Steven Spielberg, director JA Bayona, and actors Chris Pratt and Bryce Dallas Howard. We visit the set to learn how much fun Pratt and Howard are. Some decent behind the scenes shots emerge, but this mostly offers fluff. With The Kingdom Evolves, we get a four-minutes, 33-second reel with Spielberg, Bayona, Howard, Pratt, producers Patrick Crowley, Belen Atienza and Frank Marshall, and co-writer Colin Treverrow. “Evolves” looks at story elements and what Bayona brought to the film. Though brief, it gives us a smattering of decent insights. Next comes Return to Hawaii, a two-minute, 41-second reel with Pratt, Howard, Atienza, Marshall, Crowley, supervising location manager Laura Sode-Matteson, visual effects supervisor David Vickery, SFX supervisor Paul Corbould, and special effects coordinator Roy Kim Cancino. A discussion of the Hawaiian shoot, it delivers some useful nuggets about the effects but it doesn’t tell us much. Island Action runs six minutes, one second and features Bayona, Howard, Pratt, Treverrow, Vickery, Crowley, Paul Corbould, SFX floor supervisor Ian Corbould, special effects supervisor Mike Meinardus, 1st AD Michael Lerman, and actors Daniella Pineda and Justice Smith. It looks at the execution of some action scenes and it turns into one of the better clips so far. A take on animatronics comes with the five-minute, 53-second Aboard the Arcadia. It brings notes from Howard, Pratt, Bayona, Spielberg, Atienza, Smith, Treverrow, Marshall, and creature effects creative supervisor Neal Scanlon. Though the title implies it’ll cover the film’s boat set, instead it just looks at the practical dinos used in that location. Bizarrely misleading moniker or not, it brings a good discussion of this aspect of the production. We look at the newest dino in Birth of the Indoraptor, a four-minute, nine-second reel with Treverrow, Marshall, Spielberg, Pratt, Scanlan, creature effects sculptor Martin Rezard, creature FX paint finish design supervisor Henrik Svensson, creature effects puppeteers Phill Woodfine, Tom Wilton, Aidan Cook and Liam Cook, and actors Isabella Sermon and BD Wong. This show examines the practical elements used for the on-set Indoraptor. Though it would’ve been nice to learn about the creature’s design, this still gives us positive notes about the subject. Up next we find Start the Bidding, a three-minute, 18—second reel with Pratt, Crowley, Howard, Bayona, and actor Rafe Spall. It delivers a fairly superficial look at stunts, one that’s too short to offer much. Death By Dino occupies a mere one-minute, 33-second with info from Bayona, stunt performer Ray Nicholas, and actor Ted Levine. We learn about some violent effects in this super-brief but oddly satisfying given its scope. During the three-minute, six-second Monster in a Mansion, we hear from Pratt, Bayona, Treverrow, and Atienza. This show looks at influences and elements of a suspense scene. Like most of its siblings, it’s too short to get into detail, but it still boasts some useful insights. In the three-minute, 48-second Rooftop Showdown, we find remarks from Pratt, Atienza, Treverrow, Bayona, Sermon, and storyboard artist Kurt Van Der Basch. It brings another view of elements connected to a specific sequence, and it seems adequate in that regard. We revisit an original castmember in Malcolm’s Return, a three-minute, seven-second piece with Pratt, Howard, Crowley, Marshall, Spielberg, Bayona, Treverrow, and actor Jeff Goldblum. The featurette praises Goldblum and that’s about it. VFX Evolved spans seven minutes, eight seconds with notes from Bayona, Vickery, VFX producer Dan Barrow, animation supervisors Jance Rubinchik and Glen McIntosh, digital artist Dorothy Ballarini, lead digital artist Suzanna Jandu, digital artist supervisor Ben Lambert, VFX supervisor Alex Wuttke, and CG supervisor Steve Ellis. As implied by the title, we get some notes about dino CG effects here. The program looks at the topics reasonably well. Called The Conversation, a 10-minute, 16-second panel features Howard, Goldblum, Treverrow, Pratt and Bayona. They chat about Goldblum’s prior Jurassic experience, working with practical dinos, stunts, and other memories from the shoot. Nothing scintillating appears, but “Conversation” brings some fun anecdotes. With the one-minute, 26-second A Song for the Kingdom. Justice Smith sings a jaunty tune he wrote for the movie. It’s mildly charming. Chris Pratt’s Jurassic Journals take up a total of 12 minutes, nine seconds. These offer 12 sequences in which Pratt chats with a mix of film participants that includes Pineda. Smith, Bayona, Howard, stunt double Rachelle Beinart, stunt performer James Cox, assistant script supervisor Kelly Krieg, set PA Jody Wiltshire, makeup artist Vivian Baker, hair stylist Mary Mastro, 1st assistant sound Chris Murphy, stunt edge car driver Dean Bailey, and diver Peter Harcourt. As expected, this largely follows a comedic path, though we get a few nuggets along the way. I can’t decide if Pratt’s seemingly constant joking on the set would be fun or exhausting, but he’s enjoyable in these small doses. It’s also nice for some often unsung crew members to get the spotlight, and it’s amusing to hear Smith refer to family road trips when you know his parents are Will and Jada. Lastly, Jurassic Then and Now spans three minutes, six seconds. It’s a compilation of shots from all five Jurassic movies. It’s nothing special, but I do kind of like the way it shows similar sequences across the series. The disc opens with ads for Mortal Engines, Manifest, the Jurassic World: Evolution video game and the Jurassic World: Alive app. No trailer for Kingdom appears here. Bogged down with strange and unnecessary choices, Jurassic World: Fallen Kingdom feels like a missed opportunity. It makes too many missteps to turn into a winning adventure. The Blu-ray brings very strong picture and audio along with a long but not particularly deep set of supplements. Kingdom isn’t a total loss, but it could – and should – have been much better.